Ruins of the Tajbeg Palace, 2007. Tajbeg Palace or Tapa-e-Tajbeg (Pashto: د تاج بېګ ماڼۍ‎; Persian: قصر تاج بيگ‎; Palace of the Large Crown), also inaccurately called the Queen's Palace, is a palace built in the 1920s and located about 10 miles (16 km) south-west outside the centre of Kabul, Afghanistan. The once stately mansion sits atop a knoll among foothills where the Afghan royal family once hunted and picnicked. It should not be confused with Darul Aman Palace, which is about 1.3 kilometres (0.81 mi) northeast from Tajbeg Palace. Built to house the Afghan royal family, Tajbeg Palace is one of the most impressive landmarks of "Darulaman," newly created during the era of Amānullāh Khān by a team of European architects in an attempt to establish a new seat of government and modernise Afghanistan, both of which ultimately failed when religious conservatives forced Amānullāh from power and halted his reforms. The palace was eventually used as governmental and military houses until it was damaged, leaving it in ruins. Not far from the castle or Tapa e Taj Beg (Taj Beg hill), a palace for the Queen of the Timurids is said to have been found a long time ago. Terraced garden designs were preferred by Timurids and Moguls, and today some ruins remain. The Timurids and their successors, the Moguls, have kinship relations with the Pashtun tribes of Abdali Durrani and later Yusufzai. The daughter-in-law of Ahmad Khan Abdali (the wife of Timur Shah Durrani) was the daughter of Alamgir II. According to some historians. the palace seems to have been renovated by Zaman Shah in 1795 (1210 H.), which was subsequently destroyed in military conflicts, and the ruins from ancient times remain. Foreign soldiers of ISAF have documented ruins of the former castle. As with many historical sites in Afghanistan, current dynasties try to reduce the historical achievements of their predecessors. On December 27, 1979, the Union of Soviet Socialist Republics launched its intervention in Afghanistan. That evening, the Soviet military launched Operation Storm-333, in which some 700 troops, including 54 KGB spetsnaz special forces troops from the Alpha Group and Zenith Group, stormed the Palace and killed President Hafizullah Amin, who had resided there since December 20. During the Soviet–Afghan War it served as the headquarters of the Soviet 40th Army. 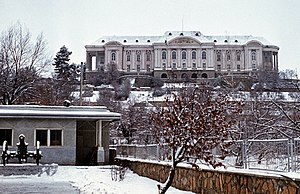 The palace was severely damaged in the years after the Soviet withdrawal, when different mujahideen factions fought for control of Kabul after the fall of President Najibullah's Moscow-backed government in 1992. The Afghan government, in conjunction with the German government, have drafted plans for renovating the palace for official use, requiring funds from private donations from wealthy Afghans. These plans are on indefinite hold as the Afghan government seeks to establish peace and stability. A similar plan was approved for the nearby Darul Aman Palace which is being renovated and set to be completed by 2019. Wikimedia Commons has media related to Tajbeg Palace. ^ Ghani, Mariam & Ashraf (8 September 2012). "Palace of Abandoned Dreams". The New York Review of Books. Retrieved 27 December 2015. ^ "SketchUp Buildings". sketchupbuildings.blogspot.com. Retrieved 10 August 2015. ^ "Everywhere: Places: Darul Aman Palace". everywheremag.com. Archived from the original on 21 December 2009. Retrieved 10 August 2015. Wikimedia Commons has media related to Darul-Aman Palace. This page was last edited on 6 March 2019, at 15:07 (UTC).